It was the news heard around the world—discount avocados. Following Amazon’s acquisition of Whole Foods, the Seattle e-commerce giant slashed prices across many items and departments in an effort to remove the best reason we had for avoiding the premium grocer. After we observed an initial pop in foot traffic the day the discounts kicked in, we wondered: would Whole Food’s price cuts lead to new, lasting consumer behaviors? Or was the spike just curious shoppers who would later return to their usual Kroger or Trader Joe’s? After four weeks, we had our answer. Amazon’s Whole Foods price cuts were leading to lasting changes in behavior. 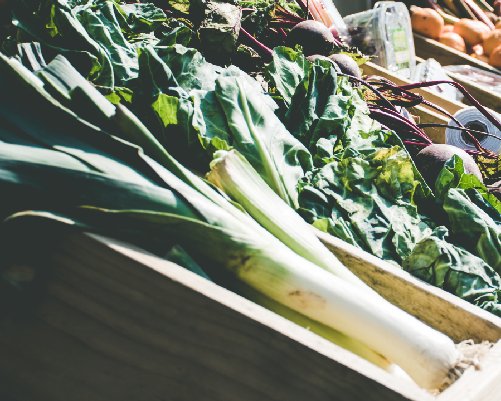 Whole Food’s share of traffic in the grocery segment is reaching new highs for the year. Other grocers should be worried. While we did in fact see a +25% spike in visitation on the first day of the acquisition, this spike was seemingly short-lived, and didn’t occur in all DMAs. While Whole Foods saw a national increase in visitation, some regions contributed to this spike more than others. For example, Whole Foods Seattle saw an +81% increase in traffic on the Monday of opening day when compared to the previous Monday — fitting for being Amazon’s hometown! As you can see from the chart above, Whole Foods saw a strong increase in foot traffic on the Monday that their new pricing took effect, however, it began to bottom out relative to the category by that Thursday. Visitation picked back up on the weekend, perhaps when curious shoppers had more time to spend perusing the price tags, or because they were getting ready to shop for the Labor Day Weekend. But Whole Foods did not initially maintain the influx of store traffic beyond opening day. Trader Joe’s visitation suffered the most during the first week of discounts. 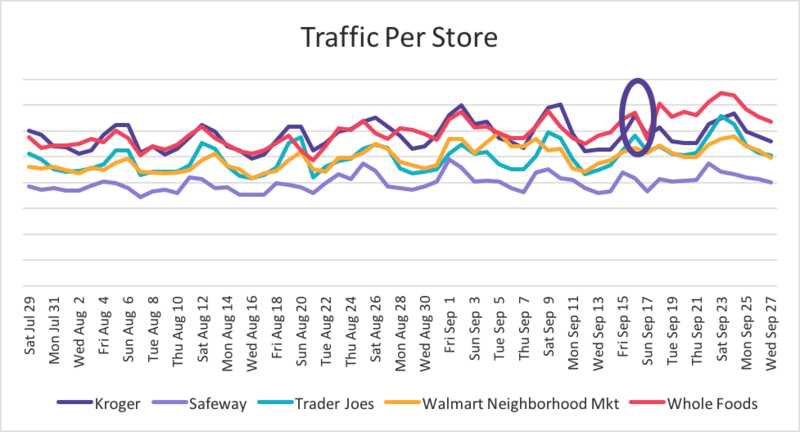 Over four weeks, Whole Foods has stolen share of foot traffic in the grocery category since their lower pricing model was first released in August. The high-end grocery chain has gone from taking 4.76% of the total grocery visit share, to 5.35%. This is the first time this quarter we have seen Whole Foods surpass the share of visit industry average of 4.6% during their opening week, making them a brand to watch as they continue to slash prices, and ramp up marketing efforts. To illustrate the sea change taking place in the grocery market, we can also look at visits-per-store. This figure controls for store count and helps us measure the efficiency of stores in generating foot traffic. If you look at Whole Foods’ number of visitors per location, before the Amazon takeover they were consistently trailing behind Kroger, and were never able to outperform them in terms of visitation for more than a day at a time. They now have surpassed Kroger for weeks at a time, making them one of the highest performing grocery brands in store efficiency at a national level. This analysis combined with the uptick in share-of-visit tells a very positive story for Whole Foods. With their new discounted price model and unmatched lunch offering, Whole Foods has emerged as an grocery force to be reckoned with. Consumers are starting to incorporate Whole Foods into their normal shopping schedules and not just stopping there for lunch or specialty off items. Grocers should be prepared to challenge them with price cuts, quality products, and aggressive marketing.